GST registration is compulsory for all entities – having an annual turnover of business above the threshold limit. These entities have to get them registered and file taxes to the government on the supply of taxable goods and services. Working on a small scale, entities registered as MSMEs also have to get themselves complied with GST. To apply for new business registration under GST, MSMEs have to submit necessary details and documents on the GST portal. 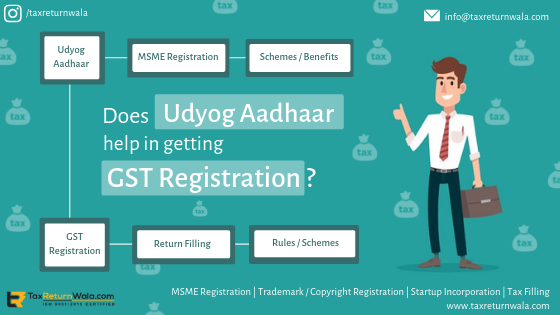 One such essential document for obtaining GST registration by MSMEs is Udyog Aadhar Memorandum. Udyog Aadhar Memorandum is 12 digits unique identification number obtained by business units working on Micro, Small or Medium Scale in the economy. The Ministry of MSMEs specifies it as a necessary condition to obtain UAM to avail various social and fiscal schemes issued by the government. Based on the registrations and reporting of compliances through UAM, these entities are provided timely advancement and developmental benefits from the government. 1. To file mandatory tax returns to government. To apply for other registrations and policies, using it as a legal document of business. 2. To avail input of taxes paid on purchases. To avail collateral-free loans, tax benefits, policy benefits from the government. 3. To apply for loans and credit facilities from both government & financial institutions. To raise easy loans from institutions and credit agencies of government. 4. To avail tax subsidies on certain supplies made by MSME, as specified tax-free by the government. To receive and avail benefit introduced by the government under various social and developmental schemes for MSMEs. 5. To open a bank account or opt for financial schemes for business. To enclose it as a supporting document for several compliance applications made for business I.e. trademark/copyright/trademark registration. 6. To avail tax exemption on exports. To participate in foreign expo and trade markets. – Collateral free loans enabled for registered MSMEs from SIDBI, NSIC, Fund schemes like CGTMSE, CGS and Credit generation scheme. – Ease in license approvals & trademark/copyright registration applications. – Octroi and Excise exemption. – Protection against delayed payment by companies. – Reimbursement of funds used in license registrations and ISO Certifications. – Concessions in Electricity charges. – Subsidies in infrastructure development loans. Integrating multiple taxes into one, GST simplified numerous tax obligations for MSMEs. On the other hand, the introduction of Udyog Aadhaar also simplified the overall process of business registration for MSMEs. Thus, focus on a common agenda, both initiatives strike for bringing ease of doing business for MSMEs.